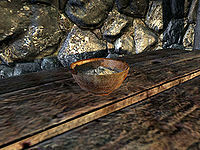 Berit's Ashes is a unique version of bone meal that shares all of the same alchemical properties as regular bone meal. It can be combined with regular bone meal to make a potion with four effects. It respawns, so you can collect more than one. The Dawnguard add-on is required for this location to appear. The ashes are presumably supposed to be unique. They are the remains of a man named Berit, who lived in Falkreath and was a friend of Thadgeir. However, the respawning samples in Dengeir's House and Castle Volkihar make it possible to obtain more than one. This issue has been addressed by version 1.1 of the Unofficial Dawnguard Patch; the ashes in Valerica's study have been replaced by standard bone meal.